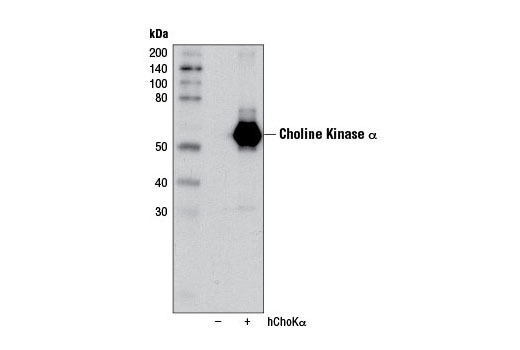 Background: Choline kinase (ChoK) catalyzes the phosphorylation of choline, a key step in the biosynthesis of the membrane phospholipid phosphatidylcholine. 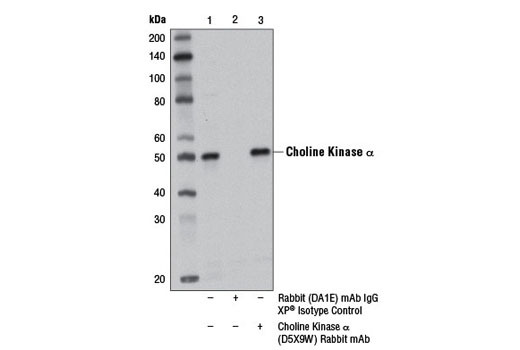 At least three ChoK isoforms exist in mammalian cells, α-1, α-2, and β. 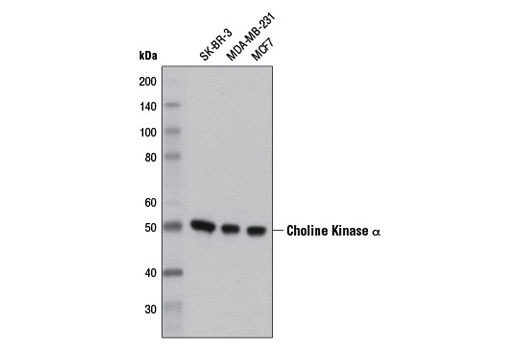 The two α isoforms are transcribed from the same CHKA gene as splice variants, while the β isoform resides on a separate CHKB gene (reviewed in 1).Research studies indicate that ChoKα levels affect signaling through MAPK and Akt pathways (2,3). Investigators have shown that ChoKα plays a role in proliferation and carcinogenesis and is highly expressed/activated in human cancers (4-7). Additional research studies suggest ChoKα may be a potential target for cancer therapy (8). 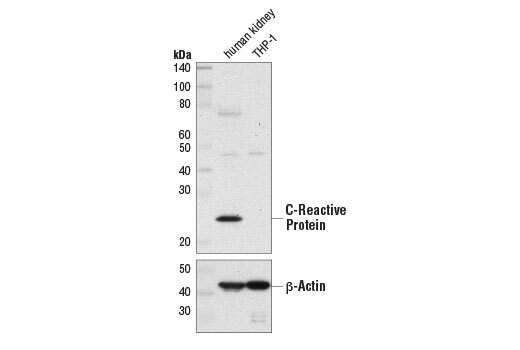 Background: C-reactive protein (CRP) is a pentraxin family protein involved in several host defense-related functions as a result of its ability to bind to foreign pathogens and damaged host cells (1). CRP is a cyclic, non-covalent pentameric protein and normal constituent of human sera that is produced primarily by hepatocytes (2). Secretion of CRP is induced by proinflammatory cytokines, including IL-6 and IL-1β, and significantly increases during acute phase responses to tissue injury, infection, or other inflammatory stimuli (3,4). The presence of CRP is often utilized as an inflammation marker, and monitoring CRP levels in plasma is a useful tool in assessing disease progression or treatment effectiveness. CRP is also regarded as a risk assessment factor for the development and progression of cardiovascular disease (5).CRP binds to phosphorylcholine that is present on the surface of damaged tissues and in the bacterial cell wall of certain pathogens (6). Through this calcium-dependent interaction, CRP promotes agglutination and initiates the activation of the complement cascade. This results in enhanced opsonization through CRP interaction with FcγRI and FcγRIIA, which facilitates phagocytosis (7). Background: CTP:phosphocholine cytidylyltransferase (CCT) is a critical enzyme that regulates the CDP-choline pathway for the biosynthesis of phosphatidylcholine. 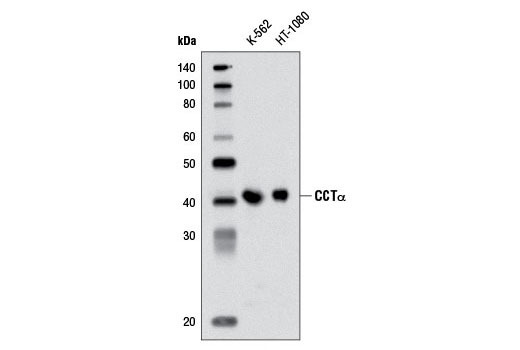 Three distinct CCT isoforms are found in mammals, including CCTα, CCTβ2, and CCTβ3 (1,2). CCTα is the major isoform that is expressed in most tissues (3). CCTα is essential in the synthesis and secretion of surfactant by alveolar epithelial cells and is important in maintaining the phosphatidylcholine level that regulates lipoprotein assembly and secretion in hepatocytes (4,5). CCTα is a major component in membrane biogenesis during cytokine secretion by stimulated macrophages (6). Monoubiquitination of CCTα prevents it from entering the nucleus and leads to its degradation by lysosome (7).